When people think of distress signals being given off by aircraft in trouble, it’s often followed by a Hollywood rescue involving a well-known caped crusader. But a recent case called on the services of a humbler hero – one of Ofcom’s spectrum experts. Engineers from Ofcom’s Spectrum Assurance team are often contacted to help trace emergency radio beacons given off by sea vessels or aircraft. These include Emergency Position Indicating Radio Beacons (EPIRBs), which are found on boats and ships; and Emergency Locator Transmitters (ELTs), which are found on aircraft. Sometimes these beacons have been activated in error. However, over the weekend there was a very real case that needed our expert help. On Friday 11 January, several aircraft reported receiving a distress signal when passing over Exeter at up to 30,000 feet. They reported this to the Civil Aviation Authority (CAA), which got in touch with the team at Ofcom’s office in Baldock, Hertfordshire. They called out Ofcom’s Spectrum Engineering Officer Andy Hayes to trace the source of the signal. The only clue Andy received about the possible location was ‘ten miles north of Exeter’. So he headed out with his signal-receiving kit, driving around 100 miles to all high points in the Exeter area, including Exeter and Dunkerswell airfields. But the receiver didn’t pick up the signal. By Monday morning the CAA had received further reports, now pointing to an approximate location of ‘ten miles east of Exeter’. Andy spoke to staff from the air tower at Exeter Airport, who told him a light aircraft had crashed in a field to the east of Exeter the previous week. They were also able to provide him with an approximate location. Andy headed out to the area and eventually identified a weak signal coming from a very rural location. After speaking to a few locals, and then the farmer who owned the field, he drove to what he found to be the crash site. A classic 1950s Cessna 195 aircraft had made an emergency landing but had also flipped over on impact. 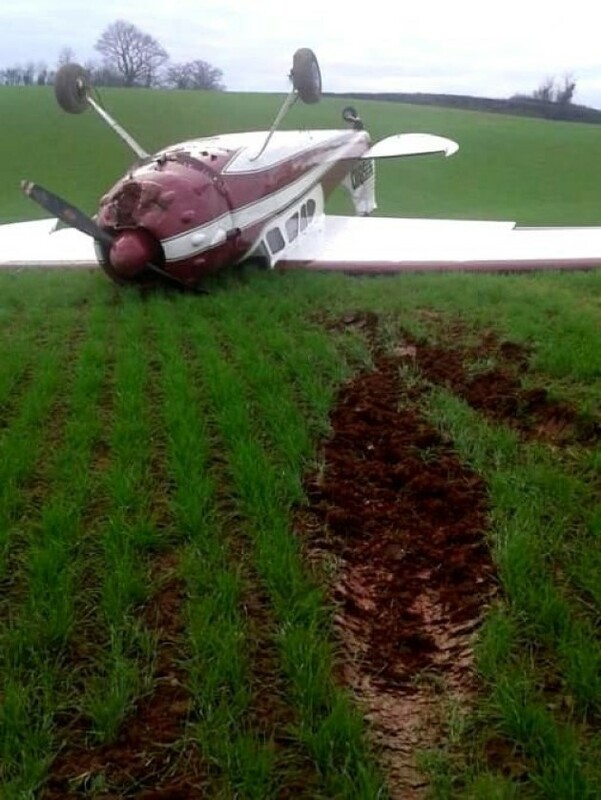 Thankfully, the pilot had walked away without a scratch. The plane was now on a flatbed trailer (still upside down) with the wings removed, awaiting removal. Using a handheld spectrum analyser, Andy was able to locate the transmitter in the rear of the aircraft. This was removed and switched off, and was then taken away from the site to ensure that it could not cause any further alerts. It was later returned to the pilot. 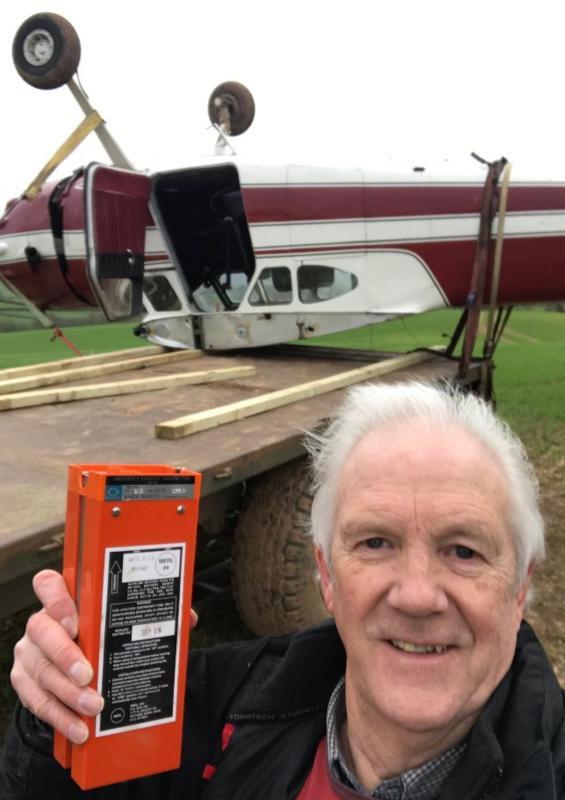 While these distress signals are most commonly activated by accident, in this case the device had been activated on impact during a true distress situation, which fortunately had no casualties – other than a severely damaged £100k aeroplane.